Die Mercurii, 16 Aprilis, 1651. THE House, according to former Order, was this Day resolved into a Grand Committee, touching the Heads of a Bill for future Parliaments, and regulating Elections. The House this Day resumed the Debate upon the Names of Commissioners, to be added in the several Counties, in the Act for the Assessments. Resolved, That "Nine Months," in the said Act, be made "Ten Months." Resolved, That these Words, in the said Bill; viz. "to the Twenty-ninth of September following;" be omitted. The Question being put, That Sir Thomas Trallopp Knight, be one of the Commissioners for the Assessments in the County of Lincoln. 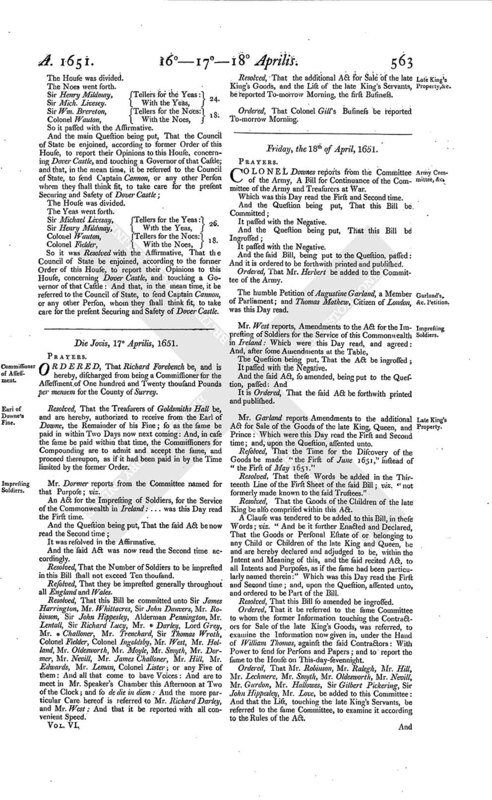 Ordered, by the Parliament, That the Persons hereafter named, be Commissioners in the several Counties and Places hereafter named, for Raising of the Assessment of One hundred and Twenty thousand Pounds per mensem: And that they be impowered, and authorized to act, according to the Powers contained in the Act for the former Assessment. For the County of Cambridge, John Barnes senior, Gentleman. For the County of Lincoln, Sir Henry Vane junior. For the City of London, Nathan Wright, Richard Downes, Esquires. For the County of Middlesex, Edwyn Rich Esquire. For the City of Westminster, and Liberties thereof, Samuel Wightwick, Ralph Darnall, John Baldwyn, Edwyn Rich, Denis Bond, Nathanael Hallows, Arthur Samuell, Tracy Pauncefoot, John Harrison, Wm. Say, Daniel Blagrave, John Downes. For the County of Suffolk, John Fothergell, * Moody, James Palmer Esquire. For the County of Nottingham, Thomas Poulton, John Gregory, Esquires; Samuel Bowles, Francis Bland, Michael Brett, Stephen Cox, Gentlemen: Richard Coppindale, of Newark upon Trent. For the County of Southampton, John Worlidge, of Petersfield, Esquire. For the Town of Nottingham, William Drury Alderman. For the County of Gloucester, Mark Grime Esquire. For the County of Surrey, Richard Fordbinch, Richard Downes Esquires. For the County of Sussex, the Mayor of Arundell for the Time being, Alexander Wilson. For the Isle of Ely, John Towers Esquire, Everard Buckworth Esquire, Barnabas Moyse, Francis Underwood Esquire, Robert Browne. For the City of Norwich, George Stewart Gentleman, Thomas Garrett Gentleman. For the County of Devon, John Ryder, of Heale, Esquire, Mathew Heale Esquire, John Fountaine, Nicholas Roope. For the County of Buck', the Bailiff of Bucks for the Time being, Edmond Denton, Esquire. For the County of York, Wm. Sykes. 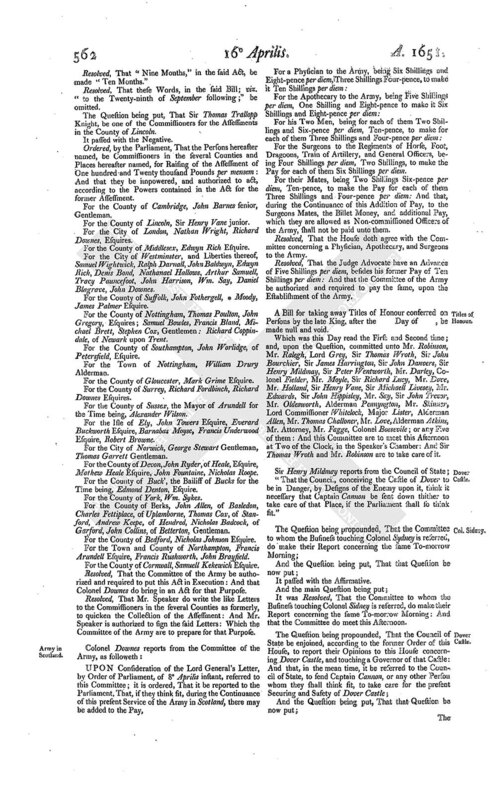 For the County of Berks, John Allen, of Basledon, Charles Fettiplace, of Uplamborne, Thomas Cox, of Stanford, Andrew Keepe, of Hendred, Nicholas Badcock, of Garford, John Collins, of Betterton, Gentleman. For the County of Bedford, Nicholas Johnson Esquire. For the Town and County of Northampton, Francis Arundell Esquire, Francis Rushworth, John Brayfield. For the County of Cornwall, Samuell Kekewich Esquire. Resolved, That the Committee of the Army be authorized and required to put this Act in Execution: And that Colonel Downes do bring in an Act for that Purpose. Resolved, That Mr. Speaker do write the like Letters to the Commissioners in the several Counties as formerly, to quicken the Collection of the Assessment: And Mr. Speaker is authorized to sign the said Letters: Which the Committee of the Army are to prepare for that Purpose. For the Surgeons to the Regiments of Horse, Foot, Dragoons, Train of Artillery, and General Officers, being Four Shillings per diem, Two Shillings, to make the Pay for each of them Six Shillings per diem. For their Mates, being Two Shillings Six-pence per diem, Ten-pence, to make the Pay for each of them Three Shillings and Four-pence per diem: And that, during the Continuance of this Addition of Pay, to the Surgeons Mates, the Billet Money, and additional Pay, which they are allowed as Non-commissioned Officers of the Army, shall not be paid unto them. Resolved, That the House doth agree with the Committee concerning a Physician, Apothecary, and Surgeons to the Army. Resolved, That the Judge Advocate have an Advance of Five Shillings per diem, besides his former Pay of Ten Shillings per diem: And that the Committee of the Army be authorized and required to pay the same, upon the Establishment of the Army. A Bill for taking away Titles of Honour conferred on Persons by the late King, after the Day of, be made null and void. Which was this Day read the First and Second time; and, upon the Question, committed unto Mr. Robinson, Mr. Ralegh, Lord Grey, Sir Thomas Wroth, Sir John Bourchier, Sir James Harrington, Sir John Danvers, Sir Henry Mildmay, Sir Peter Wentworth, Mr. Darley, Colonel Fielder, Mr. Moyle, Sir Richard Lucy, Mr. Dove, Mr. Holland, Sir Henry Vane, Sir Michaell Livesey, Mr. Edwards, Sir John Hippisley, Mr. Say, Sir John Trevor, Mr. Oldesworth, Alderman Pennyngton, Mr. Skinner, Lord Commissioner Whitelock, Major Lister, Alderman Allen, Mr. Thomas Challoner, Mr. Love, Alderman Atkins, Mr. Attorney, Mr. Fagge, Colonel Bossevile; or any Five of them: And this Committee are to meet this Afternoon at Two of the Clock, in the Speaker's Chamber: And Sir Thomas Wroth and Mr. Robinson are to take care of it. "That the Council, conceiving the Castle of Dover to be in Danger, by Designs of the Enemy upon it, think it necessary that Captain Cannon be sent down thither to take care of that Place, if the Parliament shall so think fit." It was Resolved, That the Committee to whom the Business touching Colonel Sidney is referred, do make their Report concerning the same To-morrow Morning: And that the Committee do meet this Afternoon. Sir Henry Mildmay, Tellers for the Yeas: 24. Sir Wm. Brereton, Tellers for the Noes: 18. Sir Michael Livesay, Tellers for the Yeas: 26. Colonel Wauton, Tellers for the Noes: 18. 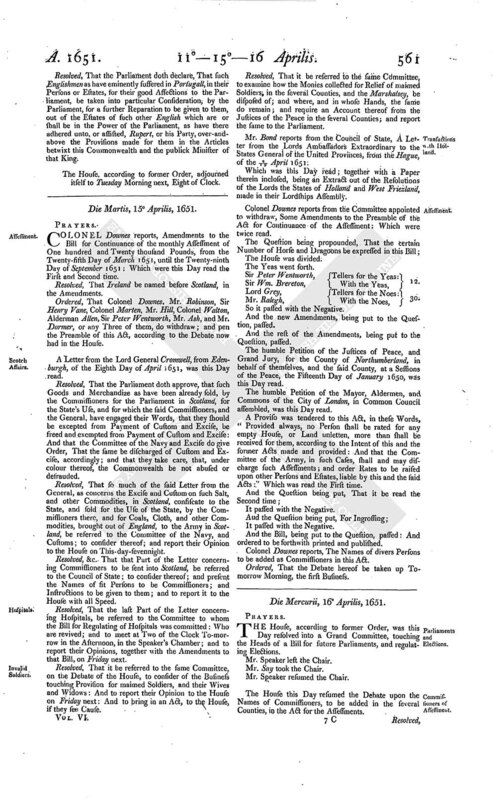 So it was Resolved with the Affirmative, That the Council of State be enjoined, according to the former Order of this House, to report their Opinions to this House, concerning Dover Castle, and touching a Governor of that Castle: And that, in the mean time, it be referred to the Council of State, to send Captain Cannon, or any other Person, whom they shall think fit, to take care for the present Securing and Safety of Dover Castle.